I’m not a big reader. This may seem like an odd way to begin a book review but hear me out. I’m not good at sitting doing ‘nothing’, I either want to be productive and busy or asleep. The reality is that once I’ve been to work, done any training, spent time with the kids and completed normal life stuff there really isn’t much time left to sit and read. But I have been making an effort recently to take 15-20 minutes each evening before going to sleep to read. There’s been many studies done that show you sleep better when you haven’t been looking at a screen in the evening and let’s be honest aimlessly scrolling through Instagram isn’t really useful or productive is it? While I may not read much and in particular fiction books the one thing that does grab me is books about running or endurance related adventures. 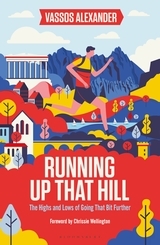 Which brings me to this book, Running up that hill, by the wonderful Vassos Alexander (who doesn’t like a guy who enthuses about ultra running on a national radio breakfast show)? I read his first book last year and much to my surprise it was actually very good, something that’s quite rare when people on the radio/television decide to have a go at writing. His second book is even better, perhaps because it features the Spartathlon as the main thread through the book, a race steeped in history and stories. A race that I’ll never do but certainly captures my imagination and I’d heard Vassos’s live interview on Radio 2 while he was actually running the race! The book is about his attempt to complete this iconic race and the adventures in training and running it interspersed with great interviews. I really enjoy Vassso’s style of writing where he weaves smaller, shorter stories or anecdotes into the main story. When you’re ultimately writing a race review this makes it a lot more interesting than a simple blow by blow description. As with his first book he’s also managed to interview some incredible runners and get their insight on this sport of running that we love so much. Big names such as Killian Jornet and Dean Kanazes but also lesser well known runners like Debbie Martin-Consani who have achieved some amazing things within their segment of the sport. I finished reading this book within a week which is quite unheard of me but honestly I couldn’t put it down. Vassos’s enthusiasm for all things running is quite infectious, that combined with some great stories makes for a book that anyone passionate about running is going to enjoy. This entry was posted in book reviews and tagged book review, running books, running up that hill, vassos alexander. Bookmark the permalink.